But in my naivety, I was repeatedly shocked at the number of (one might hope idealistic) young people whose moral compass appeared so different from my own. I have worked my entire career in a climate of Thatcherite neo-liberalism – and in close proximity to the national (if not global) hub of it all at that. On turning eighteen, I voted for Thatcher during her first two terms – having grown up during the retrenchment of the Seventies, the bright new ways of the Eighties offered a shiny optimism I hadn’t experienced in Britain before. I also remember on entering the teaching profession, a number of colleagues struggling even to make themselves speak to me once this news was out. I have always had reservations about teachers being politically active; it is within their personal rights of course, but the conflation of teaching with political indoctrination has always been rather close for comfort. I certainly remember some teachers who did not always stay on the right side of that line. But I also consider that I have a wider societal responsibility as a supposedly- educated professional. I have seen the changes wrought during decades of free-market doctrine. I’m not suggesting that these were solely caused by specific political policies – but there can be little doubt that this country’s chosen path has made it more possible for certain trends to emerge than might otherwise have been the case. The worrying thing is the self-perpetuating consensus that has taken hold that there is no other way, and which is endlessly repeated by commerce – and all of the mainstream political parties. As impartial educators, we have a duty to encourage the questioning of such claims. I know other even wealthier countries, and have observed numerous cohorts of their young from close quarters. I know that the values the students expressed in The Golden Watch are by no means equally prevalent everywhere, and while increasing wealth does not inevitably bring greater social responsibility, it does not have to bring greater amorality either. It’s more a matter of the thinking that is encouraged about how that wealth should be made, and how it should be used. As one writer to The Independent put it, it’s about whether we want to become more like Denmark or the U.S.- and this is, to my mind, clearly an educational question. I no more have an answer than anyone else to the deep philosophical conflict between social solidarity and individual opportunity, but I am certainly not ‘intensely relaxed’ about living in a society where the few are ‘filthy rich’ (to quote New Labour’s Peter Mandelson) – at least while inequality is a great as now. The privatised market-economy simply has not delivered what was claimed – and if anything has decreased opportunity, increased costs and coarsened life for the majority. Utilitarianism – whether from politicians or sixth-formers – may appear to be a practical answer to modern problems until one realises that ‘ends justifying means’ effectively unleashes a race to the bottom in terms of the moral and democratic benchmarks of society. I find it difficult to support the rampant individualism pedalled by my (as no doubt many) schools, when it leads young people to have no higher principles than those I described earlier; this is a product of an Affluenza mentality that promotes self-interest (even in academic performance) as more important than anything else. But I work in education to further a fair and just society, where honesty, authenticity and the life of the mind are valued – not the kind of debased dog-eat-dog, society-as-market-transaction that has now taken hold. Many of the people currently ringing the alarms about the supposed resurgence of the hard left themselves seem so deeply saturated in market values, that they simply cannot conceive of anything else. And it is just not acceptable for people who dissent from this not to be able either to advance their arguments or to expect to be represented. Corbyn is simply expressing values that I agree with, and he has a plain-talking sincerity that other glossy, career-politicians clearly just don’t ‘get’. I admire his refusal to engage in negative campaigning – and I would have been attracted to this no matter what party he represented. The crude, false-dichotomy terms in which much debate in British public life is now couched must itself raise concerns for the skewing effect it has on public understanding and debate. More than ever, we need an educated population that can cut through the c**p. It is not true, for instance, that all of Corbyn’s supporters are Militant Tendency cryogenes – some like me are just people who are fed up with a non-choice of self-aggrandising politicians and their unvarying diet of pulp commercialism. Neither is it true that there is no alternative to the market society – it exists quite comfortably just across the Channel; is it a coincidence that those more ‘socialist’ societies are in many cases more stable, tolerant and outward-looking than our own? As a teacher, these are issues that deeply inform my professional purpose. I do have concerns that the far-left would reassert progressive education, but hopefully the traditionalist genie is too firmly out of the bottle now to be put back. And this is certainly no more concerning than the deep damage that has been done to education by the imposition of market principles on what should be an impartial provider of social capital. In fact this surge of interest is precisely what good politics should be about – a genuine movement of the electorate wishing to express their views. The fact that the Party and the media are united in telling people that they are ‘thinking the wrong thoughts’ demonstrates the degree to which the tail of what is left of our democracy now wags the dog; as an educator, that is also something that I need to take seriously. On a more personal level, I am simply seizing the opportunity to express a preference that our broken electoral system denies, by virtue of my living in a ‘safe’ constituency. I don’t apologise for being political here – it is a truism that politics affects education, and not just at a policy level. Both are fundamental forces that shape how we live, and the society of which we form part. This issue also shows how we need more complex insights than a simple Left/Right shouting-match. I see no conflict between my conservative-traditionalist teaching and my more liberal social views; I am certainly not ‘hard-left’ and even the label ‘Socialist’ does not sit easily. It is more complicated than that – for a start, old-school conservatism actually shares this sense of social responsibility. The irony is not lost on me that in the process I seem to have ‘gone native’ as a teacher more fully than I ever expected. But how can one do this job without some sense of social idealism? And how can that square with a view of life as being just one long commercial transaction? Education has an essential role to play in developing more complex insights in people, and at times like this, these are sorely needed. In other ways, we are witnessing the political system struggling to cope with the more complex motives and loyalties of ‘thinking people’. I used to play a fuller part in this by teaching ‘A’ Level European Studies and Critical Thinking. But both courses have been scrapped or downgraded – you guessed it – thanks to (privatised) exam-board ‘market forces’. No alternative to cheating unless you get caught? I don’t think so. Principles are important. English Literature – and the E.U. About a decade ago, before it was summarily executed by the exam board, I taught ‘AS’ Level European Studies. I should emphasise that while there was a significant political component, this was not ‘E.U. Studies’ – it also included aspects of culture, history, economics, environment and more. Take-up was always a healthy eight to twelve students, and several went on to take degrees in the subject. 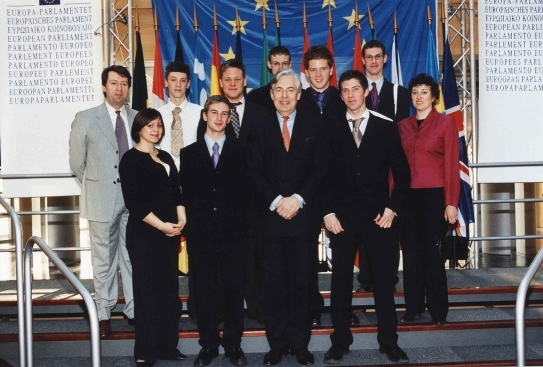 I should also say that although I am a strong pro-European, I was scrupulously impartial in my teaching – and also informed students of my personal views from the outset. I sleep easily at nights on that count. The highlight of the course was a trip to Strasbourg, where we visited the European Parliament and the European Court of Human Rights. We always travelled by train, so that students could gain a better impression of the land and journey involved. One particular moment sticks in the mind: the Finnish MEP (former rally driver) Ari Vatanen made an impassioned exposition referring to the line of photo’s he remembers from his childhood home – all of family members who had died during the War. He said that his motivation for becoming an M.E.P. was to prevent other families having to have such lines of photos. The students were dumbstruck. Year upon year, exposure (as impartially as possible) to the issues of Europe and the EU worked a significant change on the students. Coming from a profoundly conservative area, many started as strong sceptics, but as they learned more their views moderated, and in some cases underwent significant change. This, in my view, is the real power of education: not indoctrination, but in fact the opposite: to expose people to knowledge that challenges their prior ignorance. As their knowledge of both the EU and U.K. government increased, students began to make comparisons that had simply not been possible before. In the recent European elections, euro-sceptic parties made major gains, including in the U.K. In my region, for example, we now have three Conservatives, one Labour and three UKIP MEP’s. The long-serving and much-respected Andrew Duff (LibDem) has been ousted – to be replaced, in effect by a chair that will remain mostly empty. Such is the power of democracy. The E.U. polling activity Eurobarometer repeatedly reports that the U.K. comes very near the bottom on surveys relating to understanding the workings of the E.U. – and also for the expressed desire to know more. So we might conclude that many people in the U.K. are not only ill-informed, but happy to remain so – and then vote on that basis. Eurobarometer also finds that support for the EU tends to be higher in the more educated parts of society. This is hardly surprising when the British government has repeatedly resisted attempts to inform the population at large. Unlike most nations, there is no national network of EU local information bureaux. If you search for this on the E.U. 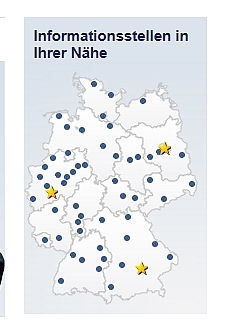 website, the issue is dodged in the U.K. section, and there is nothing to be found (anywhere) on why this is so – whereas the map below shows what the German section provides: each dot is a local office. Most other member-states have similar. In the U.K., there is one office – in central London. But I am not intending to make a narrowly political point here, despite my concern at these developments. Coincidentally Michael Gove has advocated an increase in British texts for English Literature students. Out go American works such as To Kill a Mocking Bird and Of Mice and Men – which I suspect have remained popular with teachers as much for their political ideology as anything else, and in (apparently) come more British authors. I cannot inherently see anything wrong with this, especially if it is true that choice will still remain. This might seem an odd stance for a pro-European. But rather counter-intuitively, I suspect that British xenophobia is actually the product of insecurity about our own historic identity. Having confidence in a European identity need not come at the cost of one’s national sense of self. Culture is a powerful determinant of national identity – and if people are never able to develop any sense of their own inheritance they will struggle to understand their own place in the world. The rush to embrace ‘global citizenship’ may have gone too far in this respect: we need to start by understanding ‘self’. We also need to appreciate that identities can be ‘nested’: personally, I favour a federal U.K., including devolution for English regions, and I have no difficulty in seeing regional, national and European identities as all part of the same thing. If we do not first have a strong sense of who we are, then perceived incursions of other cultures into our own – in whatever form they come – may well seem much more threatening than they need to. Ironically, by seeking to support British national identity, Mr. Gove may in the long run be doing internationalists a favour.